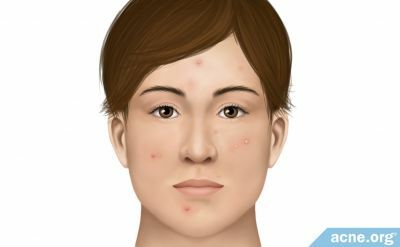 You want to look for someone with the same TYPE of acne as he has... not necessarily the same age. I had cystic acne by the time I was 14. Have you looked at the CSR on this site? Check out some of the regimens... Cetaphil Daily Cleanser for Normal to Oily skin is the best cleanser I have ever used... but there are lots of opinions. Is he about to start high school? That's the kind of acne I have... If the pimples pop, they scab, crust over, become itchy... and can stay for months (particularly if I get a cystic lesion). On most other people, that would scar, but I'm lucky... Your son may not be so lucky. Yes, I did also get the C&C acne advantage spot treatment last night maybe I should just have him use that and wash with Dove sensitive soap like he was before the football and all the pimples started? Yes, he is going to be a freshmen in 2 weeks and is horrified in going to school like this. Make a dermatologist appointment and get some antibiotics before it gets really bad and starts to scar. Okay... Well in my opinion bar soaps don't work nearly as well as the liquid soap-free cleansers... They tend to leave some residue, even the Dove soaps (I've used them and frankly they're not all that good, even for sensetive skin bar soaps). The other thing you can do are to make sure he always showers and washes his face after he is done with football for the day, as soon as he can. I really would advise against a harsh cleanser with SA or BP in it... they work for some people but for me it just dries out my skin and makes everything worse. Non-prescription acne washes tend to be pretty crappy... I'd really go for the Cetaphil if I were you. Edit: FYI, I've tried just about every OTC product out there during these 8 or 9 years I've dealt with the problem... and nothing that's advertised as "anti-acne" really works very well. The regimen I am using right now is BY FAR the most effective and pain-free thing I have done for my skin... I only wish I had learned about it sooner, or that my mom had been like you and tried to help me more. Yeah, I was just looking on line and the C&C all has like 10% bp but I found one that is the acne foaming wash which is 2% SA....what do you think? I know I want to help him I hate seeing him sad, I am supose to be working right now but I am spending all this time trying to figure out what to get him when I get off work, and he wont discuss any of this with me so I just have to buy something and put it in his bathroom. Maybe I should just go with the cetaphil. The 2% SA washes really don't do anything beneficial, IMO... The SA isn't on your skin long enough to do what it's supposed to do, and it gets rinsed off anyway, and the wash tends to just dry you out a bit, and it stings if you have an open wound. There's some product ratings on the non-message board section of the site... might want to check those out. oh also, you said the csr sounds too harsh for him.. i have pretty sensitive skin, and it's fine for me as long as i use lots of moisturizer. I wish he would join this forum, he wont even let me get on the topic of this conversation though.....thats why I was just trying to buy him something and put it in his bathroom to use....I dont know. Well I know that at that age I didn't want to talk about it because I thought it was embarassing... I didn't realize that I wasn't the only one with acne and that my parents had it too... Maybe a gentle shove in the right direction is what he needs. As long as you do NOT approach it as "you're doing something wrong, you need to do this to fix it" and more like "I know you have a problem, let's discuss it and try to help it get better by working together. I hate to see you sad, I love you and I want you to feel better." Callie, I sent you a PM- I'll help you there. Interests: Chuck Norris Round House kicks to the temple. Interests: I love to sing. I want to go to Nashville, and become a singer, get my voice out there. <br /><br />I love life. I love my boyfriend. I love living things.<br />MOVIES (The Breakfast Club, the notebook, Miracle, Pirates of the Caribbean, Love Actually, Elf, Tombstone, Stand By Me), MUSIC: (i love Jason Mraz, Miranda Lambert, tons of country and basically ANY classic rock) POLICIA: (i grew up in a law enforcement family. i love them all. Especially my daddy.) ALSO: being in love, taking pictures, watching food network, SINGING, playing in the rain, laying in the sun, driving around, dancing crazy, the US Air Force, water activities, and ALL LIVING CREATURES!!! I dont kill anything at all. Not even an ant. Love, Lust, Elation.<br /><br />Life should NOT be a journey to the grave with the<br />intention of arriving safely in an attractive and well<br />preserved body, but rather to skid in sideways, chocolate in<br />one hand, martini in the other, totally worn out and <br />screaming, "WOO HOO what a ride! ive heard that the best all aorund acne cleanser is Neutrogena Oil Free Acne Wash, both original and Foam Cleanser. I never really liked it, but i know a lot of younger people who do. It's highly reccommended. Tell him to be gentle with his skin. Only wash twice a day. Use gentle cleanser like Neutrogena Extra Gentle Cleanser or Dan's CSR Cleanser. Benzoyl peroxide works really well, and even if you think the full-blown regimen is too much, a light layer will certainly help. Order some CSR gel and only apply about a dime-sized amount to the face. Other advice you could give him (although it may be hard to talk to him about it, is to drink lots of water, stop drinking sodas and eating sugary foods, and don't touch your face) - tell him you got the advice from people who have gone through the same thing he is going through, and maybe he will listen. I have had acne since I was 14, I am 28 now, and for the first time I am clear thanks to the CSR.